Origin and Habitat: This species is of wide distribution in the forests of Burma to Thailand, China, Malaysia, Java, Indonesia and Philippines and it was described in 1823. Altitudinal range: from (20-)500 to 1200(-1500) metres above sea level. Habitat and ecology: It is a semi-parasitic epiphyte that grows among open bushes and tree over a ranges of altitudes and characteristic vegetation structural types (primary and secondary forest, and plantation). This epiphytic plant faces problems in decreasing habitat. Asclepias stellata Burm. ex Decne. Description: Hoya multiflora, the "shooting star Hoya ", is a climbing plant to 2.5 m tall, but more often has a compact, upright, shrubby growth less than 80 cm tall and doesn't branch on its own. Plants are glabrous throughout except for corolla throat. In its bushy form - and when young - it is often grown as a houseplant. It has large clusters of white and yellow flowers of waxy texture- fading slightly with age - from early spring to late summer. 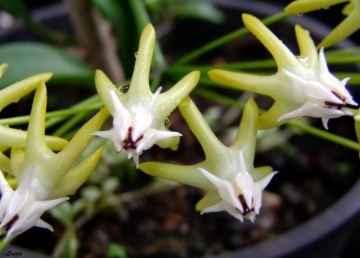 The starry flowers are very peculiar, with arrow-shaped petals, backward-bending with a large stamen column and appear similar to a “shooting star”, each of them has a brown centre and there are up to forty scented flowers in each cluster. It bears large, dark green, leathery and waxy leaves. There are a few different clones of Hoya multiflora some with green leaves with only a few flecks, other with very flecked leaves. The flowers differ some in shape and colour too. 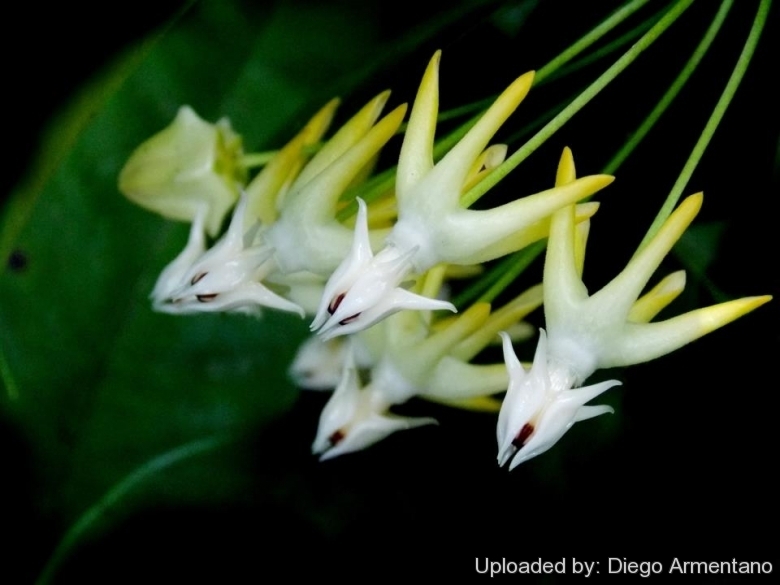 Derivation of specific name: The name indicates, it flowers a lot and often, multi = many and flora = flower. Stems Erect or decumbent, 0.3 to 2.5 m tall, one or more together, with smooth bark pale gray, yellowish when dry, with persistent leaf scars. Leaves: Rather coriaceous, 8-16 cm long, 2-6 cm wide, oblong or oblong lanceolate, sometimes narrowly so, occasionally broadest above the middle, with visible obscure veins, tip pointed, base usually tapered or wedge-shaped, glabrous, tough and leathery (papery when dried), bright green, often blotched white, paler beneath. Petiole 1-2 cm long. Inflorescences (umbels): Terminal, or terminal, extra-axillary, hemispherical, with up to 40 flowers, hanging and facing the ground, convex. Peduncle 1.5-5 cm. Blooming season: Flowers from early spring to late summer and last up to 12 days. Fruiting in autumn. Sometimes it flowers from the same peduncle again, but normally this hoya drops them after flowering. Fruit (paired follicles): Slender, linear-lanceolate in outline, 12-20 cm long. Seeds: Ovate, ca. 4 × 2 mm. Parachute typed with a plume (coma) to 5 cm long dispersed by wind. 4) Flora of China Editorial Committee. 1988-2013. "Fl. China Unpaginated." Science Press & Missouri Botanical Garden Press, Beijing & St. Louis. 13) Goyder, D. “Hoya multiflora Blume (Asclepiadaceae).” Curti’s Bot. Magazine 7 (1): 3-6. 2008. Cultivation and Propagation: Hoya multiflora is a white and yellow bloomer that flowers prolifically once established. It is considered one of the easiest hoyas to grow and is suitable for Hoya beginners if given plenty of water. It is a tropical plant that once again will do much better with some extra warmth and humidity. When in bloom it is a very interesting plant. It usually doesn't branch on its own. Cutting the top off promote branching. Growth rate: This is a compact shrubby species that grows really well and strong in optimal condition. Potting medium: Because it is an epiphyte benefits from being potted up in a very well-draining and porous potting medium that allows some air to get to the roots; typical mixes include, peat, with some fibrous soil and sand along with large-grade drainage material such as perlite, pumice, or ceramic balls. Often specialized hoya growers either use only chopped coconut husk or a good orchid potting mixture for growing their hoya plants. The medium needs to be moisture-retentive. Fertilization: The plants should be fed regularly with a fertilizer suitable for epiphytic plants. Watering: With its succulent qualities it's quite adapt at storing water for longish periods of time between waterings. Water regularly in summer, but do not overwater ( wet-sensitively) and let the plants to dry out between watering and then water again. Its roots are easily lost in pots that stay damp for any length of time. Keep quite dry with ample airflow in winter (It would probably tolerate one watering a month). In the rest period no high atmospheric humidity. Care must be taken with watering as they tends to become swollen and untidy in growth habit if given too much water and shade. Exposition: This hoya species prefers bright light but no direct sun. Outside half shade to shade (filtered sunlight or afternoon shade tolerated), inside it will need a reasonably light room in order to actually grow, although it will still get by even in a shadier spot and can be positioned almost anywhere in homes or offices. It subject to sunburn if exposed to direct sun for too long. Tends to bronze in strong light, which encourages flowering and heavy leaves production. Temperature: The optimal temperature is approximately 12-15° C in winter and 30-40 ° C in Summer (Outdoor zone: At least Zone 10, possibly cooler). Spring: When winter ends and they begin to grow again, they will require much water and soaking the pots will no longer put the plants at risk for rot. In the spring they will grow well in partial shade and leaving them out in the rain may provide them with the water they need. Summer: In the summer months they will tolerate heavy rain, but will be just as happy if the season is dry. They will tolerate hot weather outdoors as long as they are kept in strongly filtered light and this will encourage them to flower. They also enjoy some fertiliser. Moving the plants as they are developing buds may cause them to spontaneously abort the flowers all together. Autumn: In the fall keep them outdoors until the night time temperatures drop below the 10°C. Winter: Winter care presents no problems at 12° C with plenty of light. In winter be sure to take extra precautions to keep them dry, because damp cool conditions when the plants are resting is an invitation to fungal infections, but - according to temperatures –some occasional lit watering may be useful. Maintenance: Prune the plant lightly to keep it tidy. Repotting: In any season it's best to lay the stems out for several days before replanting them and then pot them only in dry soil and withhold any water until they begin to shrivel or start growing again. Re-pot every 2 years. Pest and diseases: Hoyas are generally fairly easy to grow, especially if kept pest-free. They are very susceptible to stem and root mealy bug, which can be fought easily with common pesticides, and damage from these may well initiate fungal attack. Any time when there is a dead or dying stem in the pot it is important to remove it immediately and completely before other healthy stems can become ill too, isolate the healthy parts, dry them off, and re-root them in new compost. Propagation: This species propagates readily from stem cuttings, whether in water, in soil or in a sterile medium (such as perlite).